Dr. Arthur Brϋhlmeier was for seventeen years head of a school for children aged from seven to fifteen. He then studied Education, Psychology and Journalism at the University of Zurich. He has spent the last twenty years as a lecturer at the teacher training college in Zug, Switzerland, where he was involved in a project on the concept of ‘teacher training as personality training’. 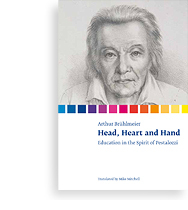 He has edited three editions of writings by Johann Heinrich Pestalozzi and his thesis was on ‘Developments in Pestalozzi’s Thought’. Dr. Brϋhlmeier’s acclaimed ‘Menschen bilden’, the universal potential of which was quickly realised, has resulted in this translation from the German. The book was translated by Mike Mitchell.